You can save big this July during the Banners.com customer appreciation sales event! $5 off orders of $50+ use promo code "5off0715"
$20 off orders of $100+ use promo code "20off0715"
$50 off orders of $200+ use promo code "50off0715"
Hurry - this offer expires on July 24, 2015. 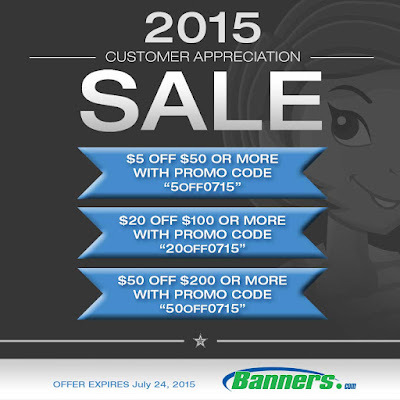 For more information, and to get started on your order, please visit our banners.com.